The photo above was provided by Jon SooHoo/LA Dodgers 2014. Go here to check out more pics from yesterday's press conference. 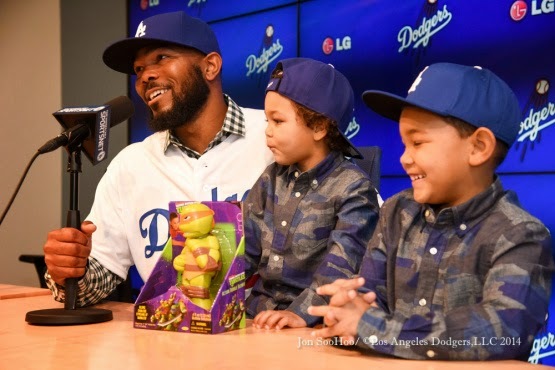 Via Jon Weisman at Dodger Insider, "Jimmy Rollins zips from red to blue." Dodgers announce pitchers & catchers report Thursday 2/19 w/ 1st workout 2/20, position players Wednesday 2/25 w/ 1st workout 2/26. Via Eric Stephen at True Blue LA, "Dodgers DFA Kyle Jensen, Ryan Lavarnway claimed off waivers by Cubs." Chris Olds at Beckett provides a sneak peak preview of the 2015 Topps Archives Baseball set. 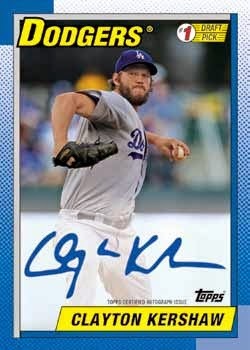 Check out the Kershaw card on the right. Via Cary Osborne at Dodger Insider, "Quotebook: Andrew Friedman on the Dodgers’ offseason moves." Via Ken Gurnick at MLB.com, "Friedman: Moves make Dodgers 'highly functional'"
Via Ben Badler at Baseball America, "How Will MLB Handle Big Changes With Cuba?"